Where do the dragon boats come from? 22Dragons is an outfit from Canada that comes to Poughkeepsie for paddler training and practice sessions during the week prior to the event. They provide the boats, paddles and life jackets for practice and the races on the day of the event. Nothing! 22Dragons supply the boats, paddles, life vests (PFDs) and a professionally trained steerer — and — we give you a professionally guided practice session the week before the race! What should I bring and wear to practice and on Race Day? Wear clothing that you don’t mind getting wet. Bring a change of dry clothing and perhaps a towel, but there will not be access to showers. Bring sunscreen, sunglasses, a hat for on shore between races, and appropriate footwear. Water shoes, sandals that can get wet, or sneakers are good. BARE FEET AND FLIP-FLOPS ARE NOT OK. In the boat, do not wear a watch or jewelry that you do not want to get wet. What about my cell phone? Do not bring electronic devices or smart phones or cameras in the boat, unless you protect them in waterproof cases or pouches. There is no “storage room” in the boats. Race volunteers will not be able to take time out of their important duties on the dock to photograph you or your friends. Try and arrange group shots while on land. No one who is not actually going out in your boat will be permitted on the dock. Valuables will not be able to be held onto or protected by the race volunteers. What will there be to eat and drink? We recommend that you bring a water/sports drink bottle and snacks. But there will be plenty of great food available for purchase at the site. Bring money to buy lunch from our vendors (or bring your own) and race souvenirs. Do NOT bring alcoholic beverages or BBQ grills. A “team bio” on the website, so an opportunity to publicize your organization, club, or team sponsor. On-site paddle training and safety review from 22Dragons before the race. Participation in two or more races. All proceeds, after expenses, go to Habitat for Humanity of Dutchess County, where it is put toward the mission of building strength, stability and self-reliance through homeownership. Team Captains can register on this website using the “Register” menu button. We are limiting the event to 24 teams, so get signed up as soon as possible. The entry fee is tax deductible to the extent the law allows. Download and print the Team Roster and Individual Liability Waiver forms. Fill out the roster and have all team members sign a waiver. All team members must have signed waivers at the time of your practice session. Final complete team rosters must be submitted to the organizers before your practice session. You will need 16 paddlers (8 must be female for a mixed boat) and 1 drummer. A professional experienced steerer is provided by the race organizers. You are encouraged to add alternates to your team roster, who can substitute in, or in case a last-minute cancellation takes away one of your paddlers. May I participate if I do not have a team of 16? You, on your own or with a few friends, can sign up to participate with Individual Registration. We will fill up your boat with other individual paddlers to make a full crew. But remember, if the team is a mixed boat, then you will need the minimum of 8 females. Will I have the opportunity to practice before Race Day? Yes, yes, yes! Practice is encouraged. All team captains must sign up for a 1-hour practice session. Practice sessions will be held in the evenings of the week before the race. What can I do to prepare and train for the race? Paddling is a strenuous activity; check with your health care professional if you are unsure of your physical capability. Cardio and strength training are recommended but not necessary. On Race Day, be sure to stay hydrated and stretch. Teams will be racing a distance of 200 meters. Teams will most likely paddle in 2-3 races (two preliminary heats, and a final). Each of the top three teams will receive a team trophy and 19 medals, one each for paddlers, the drummer, and up to two alternates. How can I monitor the progress of my team throughout the race? We will post the results from each heat on the Results Board, which will be located near the marshaling area and the Community Boathouse. Will I have breaks in between races? Yes. You will have a race every few hours throughout the day. Before your first race, your team will be instructed on how to paddle. Every time you race, your team will need to report to the marshaling area to line up and collect required equipment (paddles, life jackets, et cetera) and have your wristband checked. Is the Festival free and open to the public? Yes. 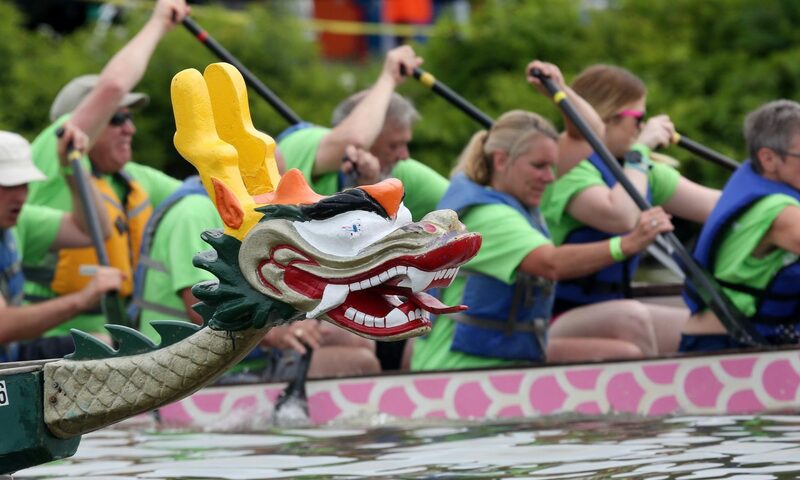 Our Dragon Boat Race is free for everyone to watch, cheer, and also enjoy the Asian Cultural Festival activities. Only Race participants will be required to register and pay race fees. Invite your friends and family to come down and cheer you on! Do we have to provide our own tent? Yes, each team will need to provide their own 10’x10′ team tent. You can decorate it, and you are encouraged to display the name of an organization or group you are connected to, but no permanent signs or displays are allowed. Bring your own lawn/beach chairs, picnic mats, blankets, etc. for seating. All material and possessions must be removed from the site by 7 pm on the day of the race. Please, no boom boxes or excessive noise. No BBQ grills are allowed. No alcoholic beverages are allowed on-site.